A good Pilates Exercise Mat should be thick enough so that you can do your Pilates exercises on a hard surface and not feel the floor. I look for a Pilates mat that is about 3/8 inches thick to a 1/2 inch thickness. A Pilates mat is different than the thinner yoga mats because you will want to roll and move continuously on it. Your exercise mat should be somewhat grippy or sticky, but not as neccessary as in a yoga mat because you will not be holding static stretches and poses. When doing a Pilates Rolling Abdominal Exercise you and your spine will be much happier on a thicker Pilates exercise mat. This mat exercise is like a massage for the spine, but it can be harmful or painful if your exercise mat is not thick enough to support your body weight as you roll back. -When rolling from a balanced position activate your lower abdominal muscles right around your center of balance at your navel to initiate the roll back. -Roll just back to your shoulder blades, not your neck, and then exhale as you roll steadily back up to a balanced position just off your tailbone. Prone or face down exercises done on your Pilates mat offer a different challenge as now you have your chest and pelvis being weighted on the floor. Once again if you have a thick enough Pilates mat you will not feel the pain of your bones against the floor. 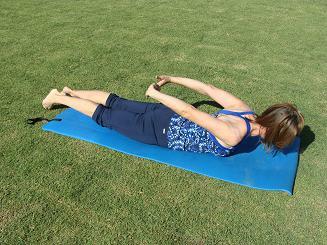 This Pilates upper back stretch and strengthener feels great and really helps with your posture. -Begin lying with your face turned to the side and hands clasped at your lower back. -Inhale as you lift up pressing your hands down past your tailbone drawing your shoulder blades together. -Exhale to slowly lower back down turning your head the other direction. Repeat for 4 -6 repetitions. For most of my students the Side Lying Pilates mat exercise is the most painful if your exercise mat is not thigh enough as your weight goes right into the bottom hip bone. With a thicker Pilates exercise mat you will have comfort and ease when doing your Pilates Side Kick Exercise sequence. -Begin lying on your side with your hips and shoulders stacked over each other and piked forward just slighly for balance. -Lengthen your top leg so you feel your waist lift off the mat and the lower abdomen tighten up. -Inhale and exhale as you lift and lower the top leg keeping length in your waist throughout. Repeat 8-10 repetitions on each side. 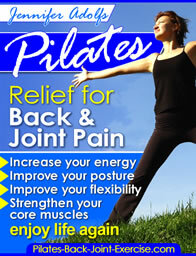 See these Pilates Exercise Mat exercises and more in my new Pilates Ebook – Relief for Back and Joint Pain.